Get 1 Free Hand Gripper (single) with every purchase. 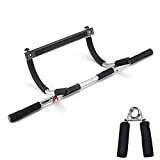 Transform your doorway into a gym – This bar is the multifunction exercise bar you can use to do pull-ups, chin-ups, sit-ups, arm and shoulder exercises – every exercise you need to build a powerful upper body! Suitable for juniors and seniors, males and females due to the thinner bar which makes a better hold possible. The bar uses your body’s own resistance to deliver powerful results fast. The Gym Bar strengthens and tones your biceps, triceps, chest, back, shoulders and abs. The steel construction supports up to 300lbs! Now it’s easy to get the strong, lean body you always wanted, right at home. If you are really keen you can easily use this in the office and even on holidays as it instantly attaches to or removes from door frames with no drilling or tools. No Drilling! No Tools! No Fasteners! Attaches and removes from door frame in seconds. It instantly attaches to or removes from your door frame with no drilling or tools. Fits all standard door frames (60cm-80cm). Quick and easy to assembly (comes with tools).Get 1 Free Hand Gripper (single) with every purchase. NOT your average – Hemp PROTEIN 500g Muscle Building QUALITY. This dairy-free and gluten-free shake beats single-ingredient hemp protein powders hands-down!